One of the most controversial European custom shops is Sweden’s SE Service, run by Stellan Egeland. 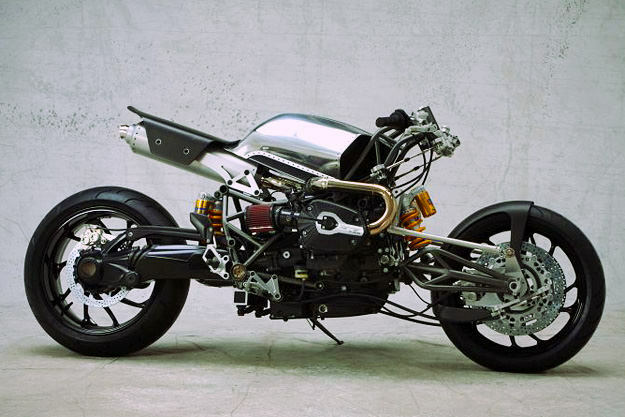 The latest SE motorcycle is the Harrier, a radical BMW-powered machine that Egeland is promoting as the first in a new line of ‘modern customs’. The Harrier reminds us a little of Bimota’s Tesi series, and took second prize last month at the 2009 European Championship Of Custom Bike Building—as much for its advanced engineering as its looks. Apart from the obvious steering hub, the front brakes are six-piston monoblocs and the bike is also packing switchable ABS.